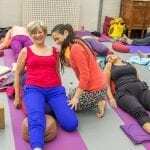 Anoshe is a fully certified yoga teacher through Yoga Arts, trained directly by Louisa Sears. Anoshe’s fluid vinyasa classes are not only a dynamic work-out, but also an invitation to align body-mind-spirit through maintaining a close connection with ones breath, and to being present in the moment as it presents itself. Classes and worshops take place place in “De Druivenkas” Doorn at the “Bartemeus Historische Moestuin”. Although situated in the forest, it has floor heating! and central heating, so it will be a special moment with the sky above us! We have been requested to park our cars in the car park of Bartemeus Historische Moestuin and not on Broekweg as previously instructed. The address is Bartemeus Driebergsestraatweg 44, Doorn. Driving on the N225 at the entrance of Bartemeus there is a meter high sign in blue with an orange”B”. (You will find this just before the start of the Sterkenburgerlaan). Turn into the entrance and drive 500 meters and you will find car parking You will notice there are small signs in blue with “historic garden”, on the right side of the parking lot, follow the signs via a lighted path.You can see the garden itself located right in the forest. Then you have to walk through the gardens, to the Druivenkas, walk through a small gate to the other side of the kitchen garden. All garden lights will be on for you. Go through the large wooden gate and there will be the Druivenkas and we will be waiting for you with a cuppa tea! If you are lost just ring me and shout “Help”!